Tin Tea Set In Suitcase Rose Pattern is a wonderfully nostalgic tin tea set all contained in a beautiful heavy duty stitched cardboard wipe clean carry case. This set has four place settings consisting of cup, saucer and side plate. There is also a tea pot and a tray to carry everything to and from the table as you entertain your guests. 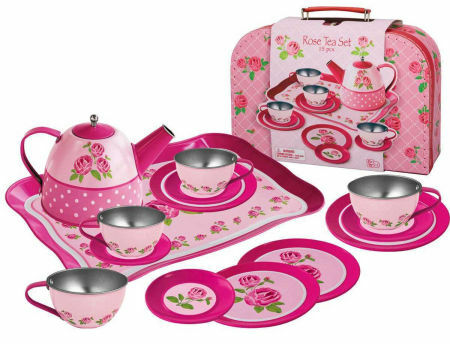 This Tin Tea Set is decorated with a beautiful rose theme and really is a very special toy. We like this because: "Lovely attention to detail and the carry case is perfect. "